Our employees have saved an estimated £77k through the use of pool cars according to the Council’s latest quarterly performance report. 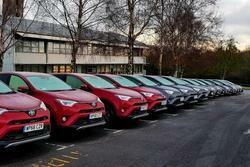 A trial pool car fleet of 15 vehicles introduced in the summer of 2017 has resulted in a 24% reduction of business mileage during the first eight months of operation. This has avoided an estimated £77k worth of mileage claims, on a yearly basis. Due to its success, an expanded 55 car fleet has now been rolled out across the Borders with additional cars at our headquarters. The expanded fleet will also be available for community use and will generate an income. Tools such as ParentPay and the parents evening booking system have been rolled out in order to automate manual processes in schools and improve the experience for parents. 84% of parents are using the parents evening booking system after a year, with some schools showing 100% attendance. The Discharge to Assess unit based at Garden View Tweedbank and the Transitional Care facility at Waverley Care Home in Galashiels which have made a significant contribution to the flow of patients through hospital, delivering improved outcomes for patients and families. Our response times for dealing with new claims for housing benefit and council tax reduction improved reaching 22.89 days in quarter 3. School exclusions approaching the festive season during Q3 were significantly lower than during the same period in the previous year. The number of people registered with our SB Alert service increased by 154 from the previous quarter. “This performance report reflects some really positive success stories which show the huge progress being made across many areas of our operations. Not only do we aim to make sure projects deliver financial benefits, but it is also important that we improve processes and systems for our customers. “The high take-up of parents using online tools, for example, reflects increasing demand for digital services which we continue to roll-out as part of our Digital Transformation programme. “We must also acknowledge the behavioural changes taking place across SBC which demonstrate the efforts that staff continue to make to reduce costs. This all helps to meet the ongoing challenge of delivering quality services in a difficult economic environment. “Recycling rates continue to be disappointing with yet another slight reduction in the recycling rate in comparison to last quarter. “Recycling is one area where Borderers could make a significant impact. By playing #yourpart and recycling responsibly, you reduce the amount of waste going to landfill, help the environment and reduce costs to the Council. This money could then be invested in other services. Along with our partners, we are encouraging people to play their part to keep the Borders thriving through the #yourpart campaign. The campaign encourages everyone in the Borders to ‘play their part’ to ensure high quality services can be maintained despite being faced with various challenges. The campaign was launched in conjunction with our Corporate Plan for 2018-2023 called ‘Our Plan and Your Part in it’. The plan not only outlines our plans for the next five years but it also provides a range of examples of what it needs from individuals, families, businesses, and communities in a time when where budgets are tighter than ever and demands for services are increasing. The campaign is also being supported by the Scottish Borders Community Planning Partnership (CPP) with the aim of ensuring the actions of communities have a positive impact across all public services. Find out more about how you can play #yourpart by visiting our website and tell us about what you’re doing by using #yourpart on social media.